Go taller, that was the feedback from property owners back in late April during the public unveiling of the draft version of the Hamilton Tall Building Guidelines. At 91 pages, the study is extensive and also readable by the layperson with many diagrams and figures to explain the guidelines in visual form. The guide goes into detail about good urban design, pedestrian friendly development, and the importance of protecting the downtown’s many character areas. 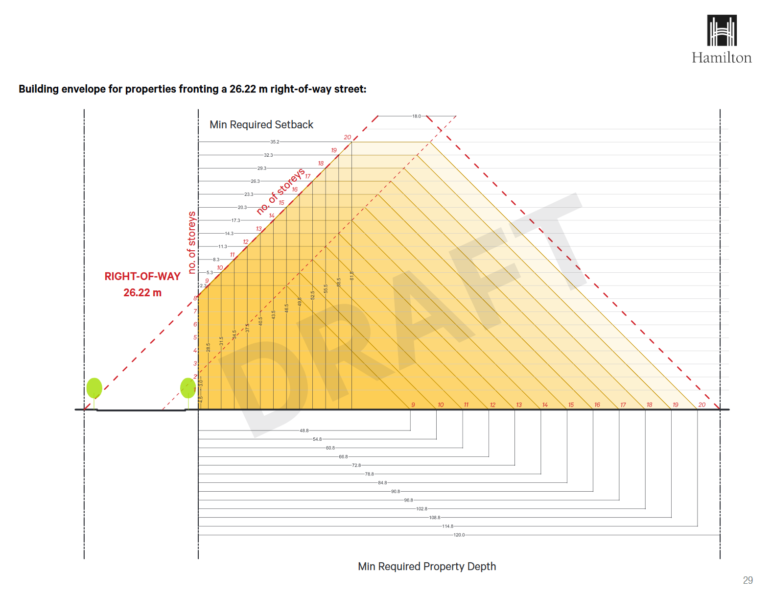 However, the guide also suggest restrictions on height based upon the size of properties which left many in the room wondering where there would be a tall building in the downtown if the property size restricts height. Overall, the mood in the room was that the guideline needed work to allow for more height, with many developers and their agents complaining the guidelines are contradictory as the building envelop plan rules out nearly every property in the study area from having a tall building. Even representatives of the neighbourhood associations present were concerned that the study fails to allow tall buildings on vacant parking lots due to the envelopment requires. A diagram of suggested building height limits based upon property sizes in Downtown Hamilton. Consultants for the City, SvN Architects + Planners, took the feedback under advisement. The guidelines are now under revision, Hamilton’s City Clerk will not disclosure the outstanding business list for Council committees and we do not know when this item is scheduled for consideration by Council. Editors Note: The Public Record covers nearly every public meeting at City Hall. This causes a backlog in work during weeks of many meetings. This is an item which got caught in that backlog.